HPD is honored to have Colonel Tom Manion, USMCR (Ret.) here in Houston for his upcoming book signing of Brothers Forever, which captures the story of Travis Manion and Brendan Looney and their ultimate sacrifice. 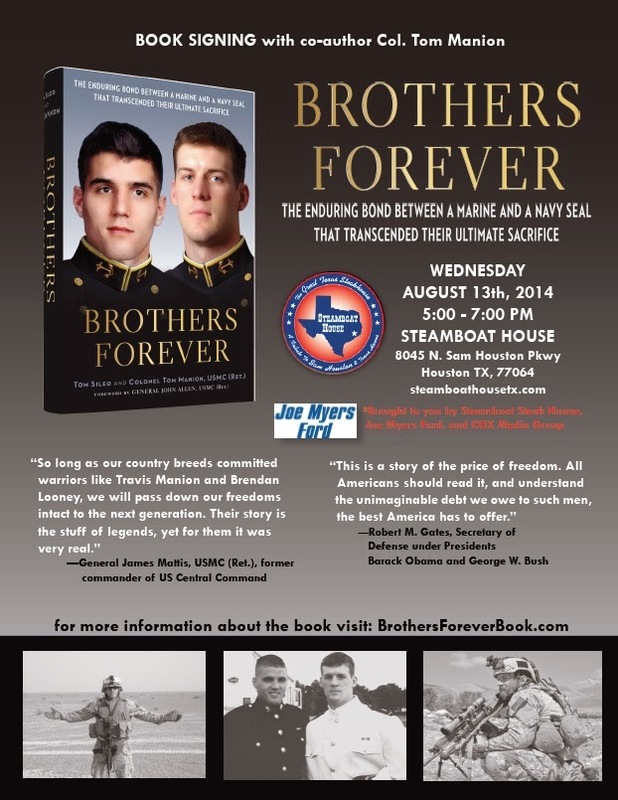 The signing will be at The Steamboat House, 8045 N. Sam Houston Pkwy, on Wednesday, August 13th from 5pm – 7pm. The death of Travis Manion was the catalyst for the 9/11 Heroes Run. Houston has embraced the 9/11 Heroes Run, and it has become our signature event for 9/11 ceremonies. Nationally Houston has had the largest venue for the last 3 years. To register for the 9/11 Heroes Run, which will take place on Saturday, September 6 at Ellington Field, CLICK HERE.